Bringing people together to share memories to tackle social isolation. The Living Memory Association brings people together to share their memories, make new friends, and record their life stories for future generations. 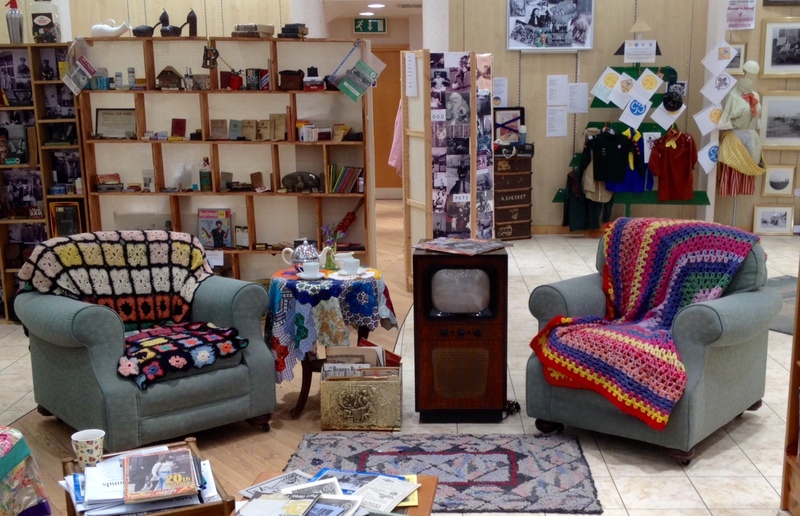 We have been working in Edinburgh and the Lothian since 1986, and strive to use reminiscence in new and innovative ways, not only to preserve memories but as vehicle for tackling social isolation. Living room area in Little Shop of Memories. We received our Big Lottery Fund Scotland grant to directly fund and develop our Little Shop of Memory project which is based at Ocean Terminal shopping centre in Leith. This is a reminiscence centre in a shop unit – it is full of familiar items from the 1920s to the 1980s – all there to be picked up and handled. We have a lounge area, soft seats and sofas where you can sit and chat or read one of the books from our reminiscence library. Being based in a shopping centre has taken our work in a new direction as this is not a traditional community venue but a busy commercial environment. It has been a surprise success. Ocean Terminal has raised our profile considerably and brought our work to the attention of many more people throughout the city. 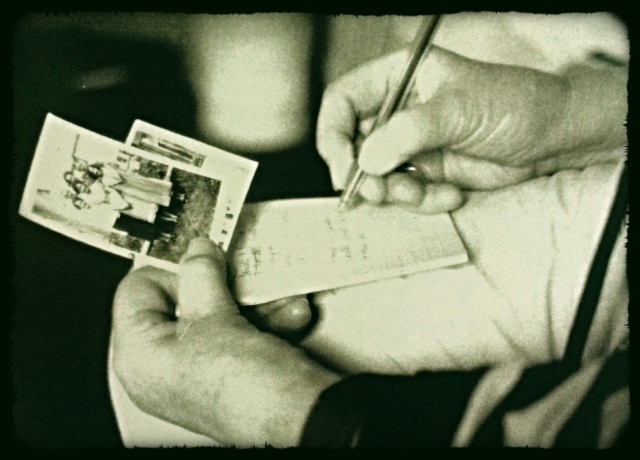 Filling out details of a donated photo for the archive. However, we have run the unit on the minimum amount of funding and it’s been frustrating that some of our visitors would benefit and appreciate greater involvement at our centre. Therefore our Big Lottery Fund Scotland grant is most welcome and means that we will now have dedicated staff time to involve and support isolated older people on a regular basis. We will be able to run a whole range of activities, such as reminiscence groups, art and drama projects and the creation of life story books. Our clients will be able contribute to a rolling programme of exhibitions displayed at The Little Shop of Memory. 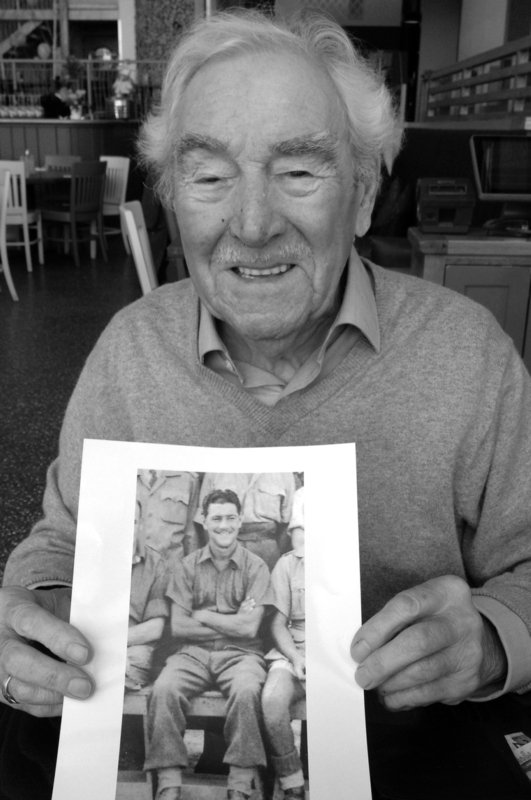 Bill Rae, 94, holding a 1941 photo of himself as a Prisoner of War in Italy. This includes people like Bill Rae, who is 94 and comes to visit us on a weekly basis and regularly chats with our volunteers and other visitors. His memories – including time as a Prisoner of War in Italy – have been recorded and appeared in a display last year. Another of our visitors has had his memories of his childhood in Portobello recorded and this was made into a very popular display. He was able to proudly show off his exhibition to his wife and grand children. This is a great end product to our work. Last year we had over 25,000 visitors from all over world, ensuring that these local memories become international.